Advancement Via Individual Determination (AVID), is an elementary through postsecondary college readiness system that is designed to increase schoolwide learning and performance. The AVID system accelerates student learning, uses research based methods of effective instruction, provides meaningful and motivational professional development, and acts as a catalyst for systemic reform and change. Watch the must-see video, ACS AVID: Shouting Our Story. Joining the AVID community is one of many opportunities available to UNC Asheville Education licensure students. As an AVID Tutor, you have the opportunity to work directly with students in Asheville City Schools. AVID provides UNC Asheville students with a foundation in specific methodology that has had a transformative effect on students and their families. Johns Hopkins University, UNC Chapel Hill, the University of Alabama, North Carolina A &T, and UNC Asheville, among many other colleges and universities. Many of our graduates receive scholarships to attend college, and Dell Scholarships have been awarded to several Asheville High School AVID graduates. As a UNC Asheville student and particularly an Education licensure student, there are many ways in which you may become involved with the AVID program! UNC Asheville students work as AVID tutors and are an integral part of the AVID curriculum in grades 6-12. Each year, 80 AVID tutors work with students in the classroom four days per week, facilitating small group discussions based on work students are doing in their core academic classes. Some tutors work in paid positions and others work to complete the field component of their Education 314 class. All tutors complete extensive training in AVID methodology. AVID students in Asheville City Schools are in grades 6-12. Students and their families make up the core of the AVID program, and there are several opportunities each year for meeting with families to talk about AVID expectations, student successes, and how to help students prepare for college. At the end of each academic year, AVID sponsors a family and community banquet to honor gradating seniors and rising freshmen. Most AVID students will be the first in their families to graduate from a four-year college or university, and we are especially proud of our first generation of AVID students who have completed college! Each year, UNC Asheville sponsors campus visits for AVID students in Asheville City Schools and from AVID schools in our region. Students attend college classes, participate in workshops, tour campus, and experience what life is like on a college campus. For two weeks in June, Asheville AVID students have the opportunity to participate in AVID Summer Bridge, an enrichment program focusing on the transition between middle and high school. Several of our AVID tutors, upon graduating from UNC Asheville, have continued to work with Asheville City Schools as teachers. 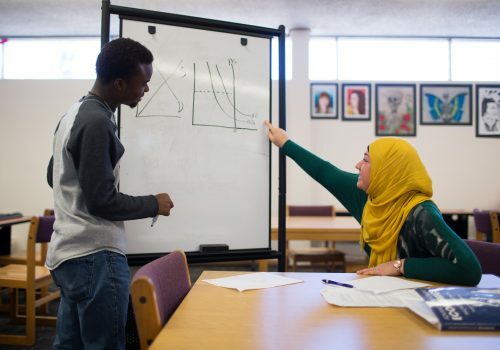 Many former AVID tutors are now teaching across the state and beyond. We are excited to claim several UNC Asheville graduates who completed the AVID program in Asheville City Schools.